Blueprints for Sewing patterns are simple, flattering, comfortable, and classic with an artistic edge. They emphasize functionality and simplicity and feature thoughtful embellishments and adaptable cuts. Each pattern takes its inspiration from an architectural style. Blueprints patterns are designed to help sewists of all levels create clothing that they love to wear. 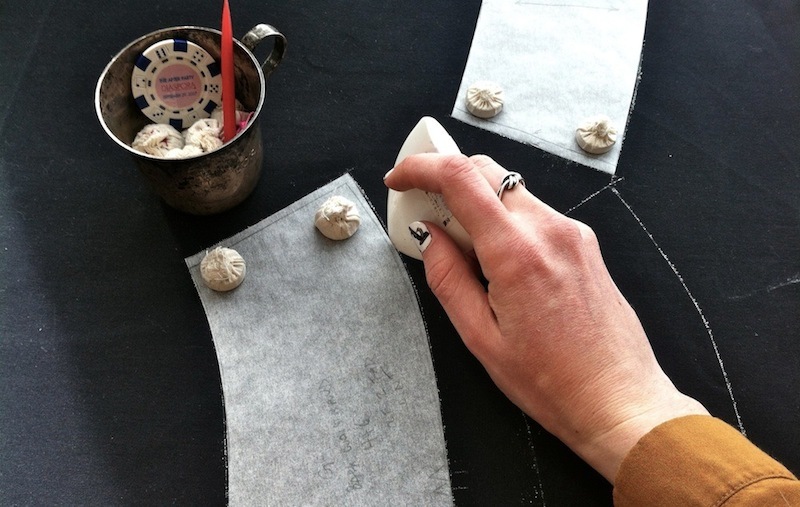 For those new to sewing, each Blueprints pattern is a mini sewing lesson, introducing techniques that help to make fine, detailed sewing easier. For more experienced sewists, every pattern spotlights one or more techniques that can be applied to other projects with fabulous results. Blueprints are designed to facilitate a variety of common fitting adjustments – not just length like conventional sewing patterns. Though they provide methods for fine tuning, they can also be sewn up without adjustment with great results! Sewing your own clothing is a way to connect with your creativity and individuality. By making, we can better appreciate the world around us and the things we consume. I have made clothing since I was very small. I never thought much of it, though it stayed a core component of my life through my early years as a punk rock teen, to recycling by-the-pound 2nd hand clothes to make outfits in college. The desire to create clothing grew and strengthened, through my dissatisfaction with the available clothing (and the industry behind it) and well as the intense satisfaction I gained from creating things by hand. At some point, I realized that sewing was an unexpected and under-represented skill. I spent most of my early adult life doing alterations, making custom clothing for others, dabbling in many areas of the fashion world, and teaching others to do the same. Teaching sewing was what really got to the source of it all. Helping people sew, to make and design their own clothing, has been and continues to be a rewarding and liberating experience. I loved the idea of taking my experience and using it to create informative and fun sewing patterns for a new wave of sewing enthusiasts. The artist and intellectual in me, however, felt I needed to bring a bit more to the table. So, Blueprints for Sewing was born. I live in beautiful Norfolk, MA, a rural suburb of Boston. I teach at many Boston Metro area shops and schools, including JP Knit & Stitch, The Eliot School, Bay State College, and the Franklin Mill Store. I give lectures and conduct workshops on sewing, fashion, and activism and have worked with students at Harvard University, Boston University, Wellesley College, and The School of the Museum of Fine Arts. I am a member of the activist knitting collective New Craft Artists in Action. When not teaching, sewing, and designing patterns, I like to knit & crochet, cook delicious food, watch movies, drink beer, grow things, run, and spend time with my partner and my animal friends.